With the new Thameslink trains going through both Westcombe Park and Charlton it’s become quite a bit easier for Blackheath residents* to get to North London – specifically St Pancras and Kentish Town. Sometimes the trains go further to West Hampstead and even to Luton, but I think they just go as far as Kentish Town on Sundays. *walk, or 108 to Westcombe Park and 380 to Charlton – either can be picked up from Royal Parade bus stop G by the beech trees. It’s about 30 minutes from either station to St Pancras and once you exit into the main station if you head right, to Midland Road, you’re pretty much right next to the British Library. (From Blackheath I’d normally go to Charing Cross and then get a 91 bus so probably I’m not saving that much time overall but it’s fun to try new journeys). The James Cook: the voyages exhibition was great. We weren’t allowed to take photos so we’ll all have to imagine and there’s quite a lot online about it. I made notes though. Lot of questions, but first a couple of short videos. Here’s David Attenborough talking about the fact that charts based on James Cook’s navigational work were still in use in the 1950s. 1. How did they create maps from visiting the coast? 2. How did they print them so neatly. I know it’s a mistake to assume that people from the past couldn’t do stuff (evidently they could, and did it remarkably well) but I think I am fairly ignorant of how you’d stand on a beach somewhere and work out what the outline of a country looked like. Clearly it involved time, effort and probably theodolites but it still seems like an absolute mystery to me. Here’s the answer though: How were maps made before satellites? And then the printing of the maps – I assume some very effortful and possibly wasteful engraving would start the process off. There was a huge chart that had obviously been printed in parts and glued together. It was very impressive. 3. On the 1759 ‘Passage from Cape Torment’ what do all the little numbers mean? The only other place I’ve seen these and wondered what they are is on the notices to mariners that the Port of London Authority put out to let Thames users know what’s happening. I think they’re depths of the water but didn’t get any further than “I wonder what those numbers are”. Saturday 7 July, same time, downstream of #Woolwich Arsenal Pier. Yes, they do refer to the depth of water from hydrographic surveys or ‘soundings’ (now I am wondering about the origin of that word!). What do the numbers mean on a nautical chart? 4. Joseph Banks was a handsome chap as painted by Joshua Reynolds. 5. Why did people want to know the distance between the Earth and the Sun in late 1700s? 6. I need to find out how telescopes (especially those of the 1700s) work. I was peering at a telescope which was involved in viewing the transit of Venus. It had an eyepiece and a sight at the other end above the main telescope which had a pinhole opening at the front end and presumably an opening at the other end but I couldn’t see it. You’d definitely not look through any holes directly if you wanted to keep your retinas – how did they collect the image? 8. How do people read other old handwritten diaries? While Joseph Banks’ writing was pretty easy to read the same can’t be said for others and a lot of ships’ records and diaries just look like Elvish to me (pretty but incomprehensible). There are always legends next to these artefacts explaining what’s being said and I often wonder “how do you know?”. I suppose if you spend a bit of time with a bit of text you eventually pick up what a letter or word might say and can keep going back and making sense of bits that previously didn’t. I assume it’s quite an iterative process. There were musical instruments and drawings of musical instruments and I was struck by the written depiction of one of them, describing its sound as “representing the ancestress Hineraukatauri who personified flute music.” It seemed a very specific thing to represent and made me chuckle, wondering what friends of mine might personify (and me of course). Jo, the ancestress who personifies … ? I’d never really given much thought to who you’d need on an expedition to Tahiti, or any other ship-based journey undertaken by James Cook and his team. There’s obviously a lot of art in the exhbition but it’s easy to just look at art and go “oh that’s nice” and then read the description and find out more. But the exhibition gives plenty of space to describe the artists and their work and their importance to the voyages. No photography possible at the time (and no photography permitted at the exhibition either of course!) Lots of the paintings and drawings are literally just getting the lie of the land (and people, animals, plants) and when one of the artists, Alexander Buchan, dies Joseph Banks is sad that he’s lost a friend, but also that he’ll no longer be able to demonstrate some of the sights back home as he can’t reproduce them. 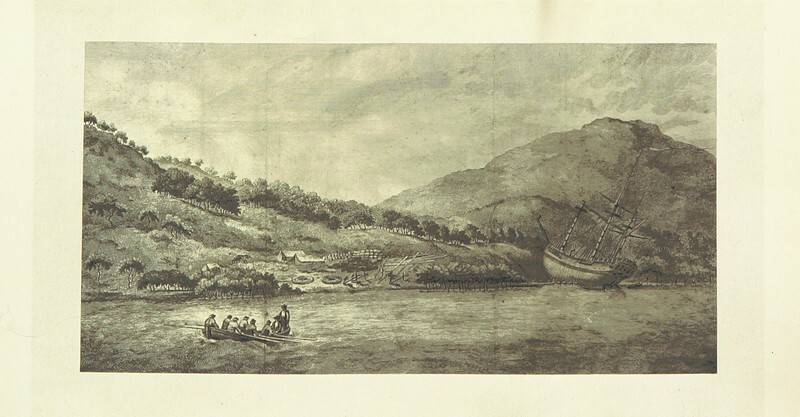 On an occasion when the crew of the ship were refused permission to land at one place (other than permission given to collect fresh provisions under military guide) the ship’s artist was told just to make some sketches of the shoreline. It reminded me of that bit in Silence of the Lambs where Jack Crawford acknowledges that Hannibal Lecter might not help Clarice Starling with her questions in which case she is to continue with straightforward reporting – what his cell looked like etc. Apparently Joseph Banks sneaked off the boat one day anyway and had a look around. There were also some really lovely drawings of Ipomoea indica (blue morning glory) by Sydney Parkinson and I wondered if when he finished these if he showed them to people with a sense of pride (“look at this lovely thing I’ve made”) as so many of us do on Instagram (cough), or if he and others considered these only in the most perfunctory sense. The level of the detail on the leaves was amazing. It’s always lovely to see herbarium specimens too. There’s something quite magical about the world of botanical collections and the ethnobotany (how people use plants) that accompanies them. Next to a fantastic painting of a young great white shark (didn’t get the name of the painter I’m afraid, but he was the youngish (17yo) son of another painter) there was some info about Banks and team having watched it from the ship and learned a little more about how sharks ‘work’ and then the text swiftly moves on to a discussion about it having been delicious. This concept (discussion on the main features of an animal then marks out of 10 for its edibility) cropped up in a couple of things – there was also a squid beak in a specimen jar which Banks had picked up from an animal in a pretty damaged state. The rest of the animal isn’t in the jar because they ate it and enjoyed the meal. It looked quite magical with trees and a rock that had a large hole in the middle. Parkinson had drawn a boat in the water on the other side. You can see it here. I’d never really looked at one so up close before and noticed all the little lines. That must take ages to produce. A mixture of line engraving and hatching. Banks was supposed to join Cook on a later expedition but there was some disagreement and that didn’t happen. Instead Banks went to Scotland and Iceland and there were some lovely drawings and paintings from their trip including a couple of an Icelandic geyser – quiet and exploding. Reminded me of a chap called Forbes who visited another Icelandic geysir a hundred years later and put it to use cooking some provisions. They also went to Orkney, which I’d always recommend, and in a few weeks they’ll be having their Orkney International Science Festival. It clashes with the Charlton & Woolwich Free Film Festival though. I always thought of skimmed milk as a modern invention so was surprised to see it mentioned in this context. In 1771 Cook visited the musician Charles Burney who lived in Queen Square, Bloomsbury. Burney had a map of the world and asked Cook to mark, with a pencil, the line of his first voyage. Burney then added a note to the map that Cook’s line would remain visible forever as he’d fixed it with skim milk. The line is indeed still visible, but I don’t know if it was in that much danger of fading? Apparently Cook liked doing wee ‘claiming ceremonies’, as in “I hereby claim this land…” and would do it in a military sort of way with crew on land firing muskets and crew on the ship answering with volleys (cannon perhaps?). This bemused quite a few of his crew who thought it was a bit daft. The drawing for the claiming of Kerguelen Land was quite funny because there were no natives to be impressed (or horrified) beyond penguins. I wondered what other ceremonies people might have undertaken to amuse penguins. Cook himself often pondered whether the people he visited benefited from him and his crew being there. There was an example of his concern over veneral disease being transmitted and at the exploitation of prostituted women. People back home in the UK were not uniformly in favour either. I have to confess I’d assumed most people were indifferent or delighted and that concerns about the way inhabitants of the islands they visited were treated. At various points throughout the exhibition there were brief videos which had talking heads from people living in the relevant areas and how they felt about James Cook and the controversial activities undertaken. I just thought it meant ‘as seen’ and not embellished, but it seems to mean a bit more than that, in terms of the philosophical belief that the people living in these “undiscovered” (by Europeans) places were experiencing a purer and more natural life. There was a lot of record-keeping going on. Recording plants and animals, people and customs. deaths (fair bit of disease sadly and a few fights), diary entries and so on. It seems that the urge to log everything probably hasn’t gone away (think about journaling, lifelogging and the quantified self). Obviously the exhibition can’t include every single recording and I amused myself thinking about my own work-related notes for how to do stuff or things that I’ve done. Imagining some future historian converting my Dropbox files into a sort of ‘diffusion line’ for an exhibition about university administration. I’d better do some drawings to accompany that. See also Royal Maritime Greenwich’s pop-up museum about Cook’s voyages. The most up-to-date version (and any last-minute changes) can be found at the Charlton & Woolwich Free Film Festival minisite, part of the Free Film Festivals group. Current list of films, dates and approximate times (precise timing for outside films depends partly on onset of twilight and location of screen). Venues in brackets refer to the map below. As part of the Charlton & Woolwich Free Film Festival I’m putting on a free open-air screening of The Dish at Charlton House next month (with subtitles ON). Come and see this lovely film and have a look through a telescope too – we’ll be joined by the Flamsteed Astronomical Society. I am exceedingly happy about this event. The Dish directed by Rob Sitch is one of my favourite films. It’s heartwarming and funny and in July 2018 was voted 16th (by Australian film critics) in the Top 25 Australian films released in the 21st century and it has an incredible 96% ‘fresh’ score on Rotten Tomatoes’ tomatometer. The film is about the 1969 Apollo 11 Moon landing, specifically about the television picture signals that were sent from the surface of the Moon and picked up back home on Earth by the receiving radio telescope at the CSIRO Parkes Observatory in New South Wales – aka The Dish. When Neil Armstrong and Buzz Aldrin landed on the Moon they were understandably keen to get out and stretch their legs rather than undergo a scheduled rest period, but this caused a bit of a challenge. The timings meant that Moon hadn’t fully risen above the horizon and so wasn’t quite in sight of the Parkes dish. L-R: Patrick Warburton as NASA’s Al Burnett, Sam Neill as director of the observatory Cliff Buxton, Tom Long as Glenn Latham and Kevin Harrington as Ross ‘Mitch’ Mitchell. *The Real Thing by Russell Morris is one of many fabulous songs featuring in the film’s soundtrack, with a lovely score by Edmund Choi. Watched the heartwarming Australian flick "The Dish" tonight. Lovely little film about Apollo 11's moon landing from Parkes's perspective. There is brief strong language and the film is certificate 12 in the UK. More info to come but it looks like the doors will open at 6.30pm, there’ll be a bit of time to grab a bite to eat (the Charlton House tea rooms will be open), look at the telescopes (or rather through them) and get comfy for the film. In a rather nice touch the Moon will be, somewhat disobligingly, only 20 or so degrees above the horizon meaning it might be a bit difficult to spot. Just like in the film!! Other stars / planets may be available, weather permitting. It’s an outdoor screening so please consider your comfort – warm clothes and light rain protection (no umbrellas please!). If the weather doesn’t look promising we’ll move into the Library so the screening will go ahead regardless of the weather. You can bring camping seats but please sit behind those on mats so that their view is not obstructed. Will be available from Charlton House. The film will be screened with subtitles on. Both Charlton House and the outdoor screening area are wheelchair accessible (and there is an accessible loo on the ground floor). There’s also a lift but won’t be needed for this visit. Buses 53, 54, 380, 422 and 486 stop nearby. The 486 can be picked up from opposite Charlton rail station, the 380 turns onto the same road a little further up the (quite steep) hill. Charlton station is served by trains from Charing Cross, Waterloo, London Bridge, Cannon Street and, less frequently, Blackfriars and St Pancras (also West Hampstead and Luton). From Blackheath it’s the 54, from Blackheath Standard 53, 54 (the 380 takes a more circuitous route) or 422, from Westcombe Park it’s the 422.